Make rectangles of the same type of yosumin to make them disappear in this mind-bending puzzle game. The more you get, the better you'll feel! 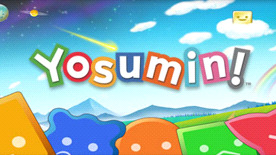 Yosumin!, Square Enix's puzzle masterpiece, is here! Simply select rectangles of the same type of yosumin to make them disappear in this simple yet challenging puzzle game. Once upon a time, deep in the Forest of the Yosumin!, which lies somewhere far away, but not too far from here, there was a shrine decorated with beautiful stained glass. One night, someone came and took the stained glass, then smashed it into pieces and spread it far and wide over the world. Work your way through the world of the yosumin in search of the lost pieces of their treasured stained-glass window! Use the special Treats you earn along the way to help you make your way through the myriad of multifarious levels! The only limit is your skill in this never-ending game mode! How high will you fly? More than 180 challenging stages. Rich, fun-filled sounds and voices. Earn extra Treats the more yosumin you make disappear. Copyright: ©2010 SQUARE ENIX Co., Ltd. All Rights Reserved.